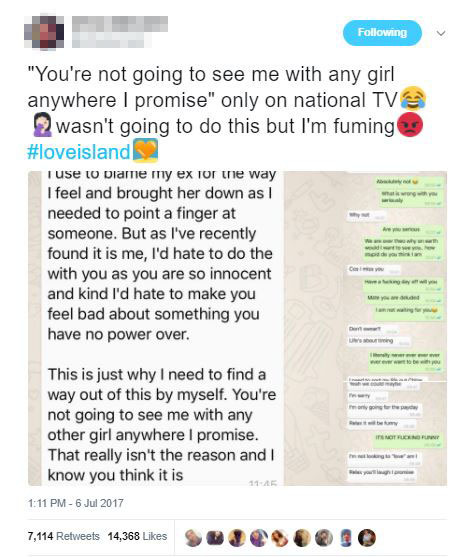 An old flame of new Love Island member Theo Campbell has hit out at him over Twitter. 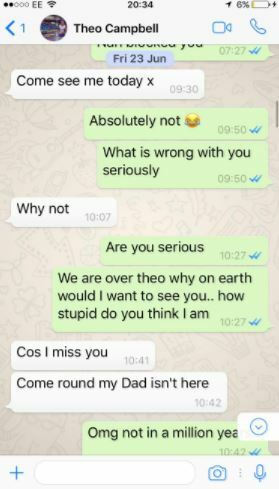 The tweet contains what appear to be break-up text messages from Theo to the girl, where he says he needs time for himself and ‘you’re not going to see me with any girl anywhere I promise’. The athlete already caused a stir on the ITV show last night after he was accused of ‘snaking’ the other guys, and now he has been ‘outed’ as untrustworthy. I use[d] to blame my ex for the way I feel and brought her down as I needed to point a finger at someone. But as I’ve recently found it is me, I’d hate to [d]o the [same] with you as you are so innocent and kind I’d hate to make you feel bad about something you have no power over. This is just why I need to find a way out of this by myself. You’re not going to see me with any other girl anywhere I promise. That really isn’t the reason and I know you think it is. 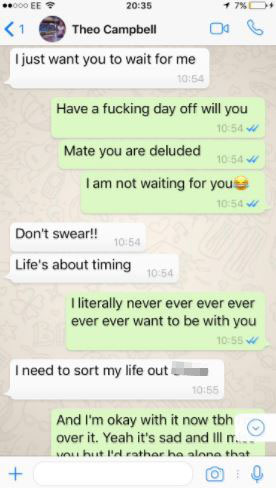 The girl tweeted that she was ‘fuming’ after he broke up with her and then appeared on the raunchy TV show based on coupling up and finding love. 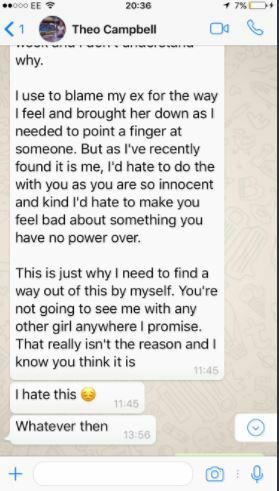 The girl, who wishes to remain anonymous, told UNILAD that she was ‘super angry’ and didn’t want to talk about it anymore. Even more shockingly, she appears to have a conversation with Theo about his appearance on Love Island. Theo wrote that he was ‘sorry’ and was ‘only going for the payday’. 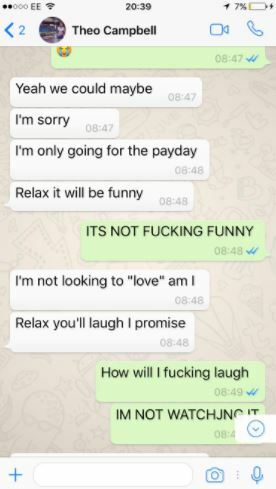 The girl replied to him saying she will not be watching the show. 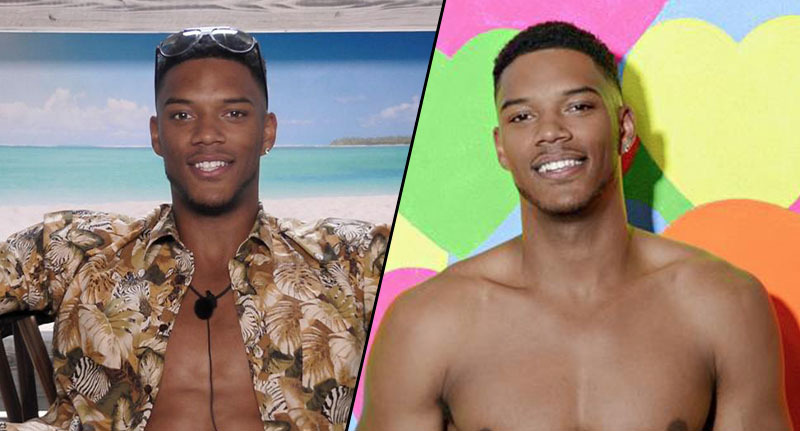 Admitting he is on the show for the money and with no intention of finding love, Theo is unlikely to get many votes from the public.